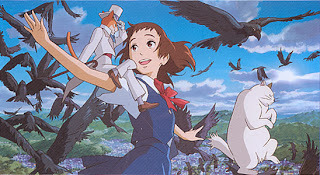 The Cat Returns, like almost all Studio Ghibli animated productions, leaves you grinning from ear to ear. It fills you with warmth. It is one of these films that feels like a breath of fresh air, full of engaging characters, warm comedy and is an absolute delight from beginning to end. A shy, awkward high school student named Haru is walking home when she saves a cat from being hit by a truck. Much to her surprise, the cat stands on two legs, thanks her for saving it, and promises she will receive a reward. It isn’t long before Haru is being showered from all sides by catnip, boxes of live mice and – most unexpectedly of all – an expectation and demand that she marry the cat she rescued, actually the Crown Prince of a magical Cat Kingdom. The Cat Returns is very obliquely spun out from an earlier Ghibli production, 1995’s Whisper of the Heart. Fans were clamouring to see more of that film’s internal fantasy sequences. A desire to accommodate those demands, coupled with an abortive plan to create a cat-oriented 20 minute short film for a Japanese theme park, led to the development of this film. Whisper of the Heart creator Aoi Hiragi had been commissioned to develop a manga based on the short, and when The Cat Returns mutated from a short into a feature it was Hiragi’s manga that was used as a starting point. Perhaps it’s a result of this odd method of development, but The Cat Returns is surprisingly short for a Ghibli film. Most of which run well past the 90 minute mark, whereas this film is done and dusted by the 75 minute mark. This isn’t a problem: the film has a fast and breezy pace that perfectly suits its material. It is such a delightful confection of a movie, filled with humour and stripped of fat. Unlike more leavened Ghibli productions like Howl’s Moving Castle or Spirited Away, there is no real variation of tone. It’s simply light-hearted and heart-warming from the first scene to the last. Sadly this is Hiroyuki Morita’s only film as director, but he has worked as an animator and artist on a string of excellent Japanese films including Roujin Z, Kiki’s Delivery Service, Perfect Blue, My Neighbors the Yamadas and Ghost in the Shell 2: Innocence. It would be remiss to discuss The Cat Returns and not make at least a cursory mention of its excellent English language dub. Generally speaking, English dubs of animé are a mixed bag – some good and some dreadful. The Disney-produced dubs of the Ghibli films are easily the best that there are. A well-selected cast of noted actors do an exceptional job here, including Anne Hathaway, Cary Elwes and Tim Curry. Those seeking a more authentic experience, or who want to watch the complete original film, will and should watch the Japanese language version. Those with young children, or who just want to sit back and enjoy the animation without having to read at the same time, should not hesitate to watch The Cat Returns in English. Elwes in particular is exceptionally good. Star Trek Enterprise: "The Shipment"
Babylon 5: "Point of No Return"
Babylon 5: "Messages from Earth"